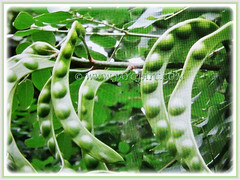 Seeds of Adenanthera pavonina have long been a symbol of love in China and its name in Chinese is ‘xiang si dou’, translated as mutual love bean. Its uses include food and drink, traditional medicine and timber. 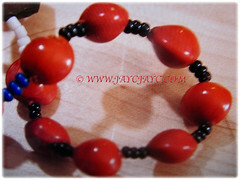 The vibrant red seeds has led to them being used as beads for jewellery. Botanical Name: Adenanthera pavonina (syn. : Adenanthera gersenii, Adenanthera polita). 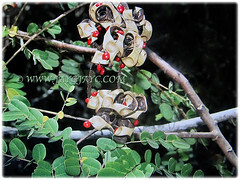 Common Names: Red Lucky Seed, Acacia Coral, Curly Bean, Red Bead/Coral Bean Tree, Red Sandalwood, Peacock Flower Fence. Etymology: The genus name Adenanthera is derived from a combination of the Greek words aden (sticky gland) and anthera (anther), alluding to the tree’s flower anthers being tipped with sticky glands. The specific epithet pavonina came from the Latin word pavo meaning peacock-blue. Origin: Native to China, southeastern Asia, Malaysia, India and Sri Lanka. It’s cultivated elsewhere around the globe. Plant type: A deciduous, perennial and and free-flowering tree. Features: Adenanthera pavonina is from the genus, Adenanthera that comprises of 12 accepted species of flowering plants. Adenanthera pavonina is a medium-sized leguminous and fast-growing tree that reaches up to 25 m tall with somewhat irregularly rounded crown. Its trunk is slightly buttressed with greyish-brown bark and inner bark is soft and pale brown in colour. Leaves are bipinnately-compound with 2-6 pairs of pinnae, each with 9-15 pairs on each secondary stalk.. The alternate leaflets 2-2.5 x 3 cm are oblong, with an asymmetric base and blunt apex, dull green on topside and blue-green underside. Leaves turn yellow with age. Its fragrant and bisexual flowers are borne in narrow spikelike racemes, 12-15 cm long, at branch ends. 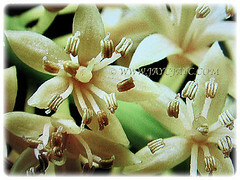 Flowers are small, measuring 2mm in diameter and maturing from white to creamy yellow to dull orange. Each flower is star shaped with 5 petals, connate at the base and having ten prominent stamen-bearing anthers tipped with minute glands. They are held in 7-15 cm raceme inflorescences at tips of new shoots. Flowers open from base to tip of inflorescence. Eventually, the blossoms will be followed by dehiscent seedpods or fruits that are thin, curved, long and narrow, 15-22 x 2 cm with slight constrictions between seeds. They ripen from green to woody black and twist before splitting to release 8-12 seeds. Showy seeds, 7.5-9 mm in diameter are vivid scarlet red, hard and lens-shaped with faint heart line around margin, eaten and dispersed by birds. Ripened pods remain on the tree for long periods. Culture (Care): Adenanthera pavonina or Red Lucky Seed grows easily with the least maintenance. Soil: Neutral to slightly acidic and well-drained soils. Others: Requires a position sheltered from high winds. It is cited as very invasive in certain regions. Take note that raw seeds are poisonous. Generally free from serious garden pests and diseases. However, its wood is very susceptible to sapstain fungi and the sapwood is susceptible to dry wood termites. Adenanthera pavonina or Red Lucky Seed is deciduous, shedding leaves for brief periods every 6-8 months. A tree of the humid, lowland tropics and subtropics. It grows best in areas where annual daytime temperatures are within the range of 22-28°C but can tolerate 12-36°C. It is susceptible to breakage in high winds, with most of the damage occurring in the crown. It flowers early spring to late summer fruiting in mid summer to autumn. Propagation: Easily propagated from seeds and the seedling have epigeal germination. Its seed coat is extremely hard and needs scarification before sowing. Alternatively, it can be propagated from large stem cuttings. 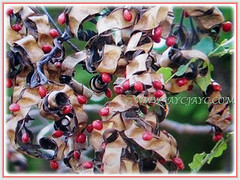 Usage: Adenanthera pavonina or Red Lucky Seed is often cultivated as an ornamental garden plant or urban tree. 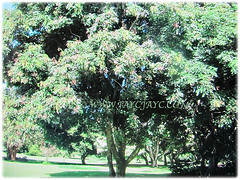 The tree is fast-growing with an attractive and spreading canopy that makes it suitable as a shade tree. Ideal to be grown in large parks and garden. It has the ability to fix atmospheric nitrogen. Young leaves are cooked and used as a vegetable. 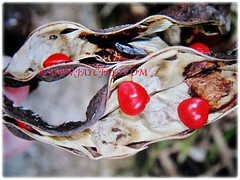 The vibrant red seeds has led to them being used as beads for jewellery. 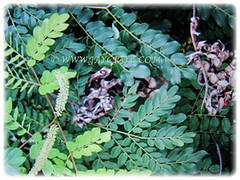 In traditional medicine, a decoction of its young leaves and bark is used to treat diarrhoea. Also, the ground seeds are used to treat inflammation. 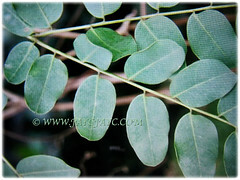 This tree is used for making soap and a red dye can be obtained from the wood. The wood which is extremely hard is used in boat-building, to build cabinets, furniture, wood ornaments and houses or as fuel. Locally used as fill for tetrahedral bags used in children’s game of ‘five-stones’.